This real obscurity from St Louis, MO is one that really grows on you. 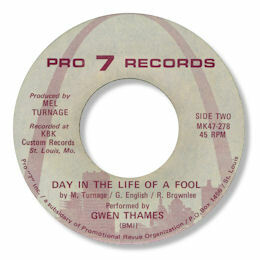 At first Day In The Life Of A Fool seems failry routine but listen again and you can pick out the subtle nuances of Gwen's vocal as she shifts emphasis from phrase to phrase, and uses delay to get even more emotion out of the song. This is high class singing all right. The spare backing is well done and the unusual chord structure is another aspect that gets better with each play. The funky top side has had some plays on that scene.